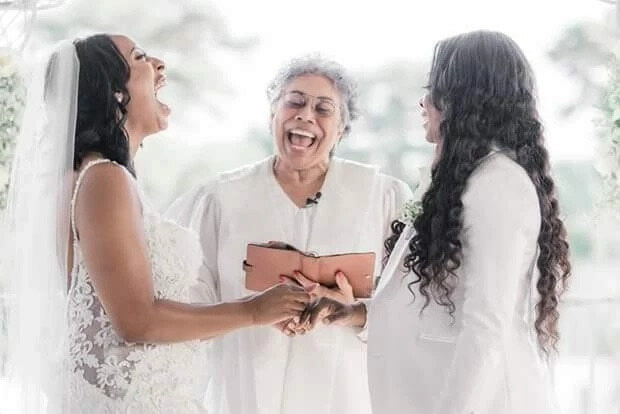 Pictures of a lesbian couple have just gone viral on social media after they walked down the aisle at Virginia Beach. The wedding reception took place at The Yacht Club, Marina Shores on Saturday, April 7. The couple was identified as 30-year-old Chantel Nicole Beverly, a 5th grade teacher and 33-year-old Shavonia Peterson, an exceptional education teacher. Beverly who is the bride narrated how she met Peterson. She said their path crossed at a night club in 2011 and seven years after they tied the knot. She said: “I walked into a club one summer night in 2011, she had no idea she’d find the love of her life, Shavonia, on the dance floor. But that’s exactly what happened. Seven years later they tied the knot and their gorgeous nuptials will move you. Being a bride felt like I was on cloud 9. After I got past the nervousness part, it was the best feeling in the world. I felt so beautiful and so loved. There were a few overwhelming moments but for the most part, it was wonderful. It took a while for me to find ‘the one. Shavonia is very interesting. She’s actually the opposite of me. I’m more optimistic and she’s more realistic. I’m very outgoing and she’s more reserved. She’s very organized and I could be all over the place sometimes. However, she’s my perfect match. She’s loving, caring and will do anything for those she holds near and dear to her heart. She is the yin to my yang.” Speaking on their proposal story, the husband Peterson disclosed that she proposed to Beverly on Thursday, December 15, same year they met at a night club.